Glass Reversible Trumpet Vase. H-24", Open D - 6", Bottom D - 6", Pack of 4 pcs Discounts Apply ! Glass Trumpet Pilsner Vase, aka Reversible Trumpet Vase. 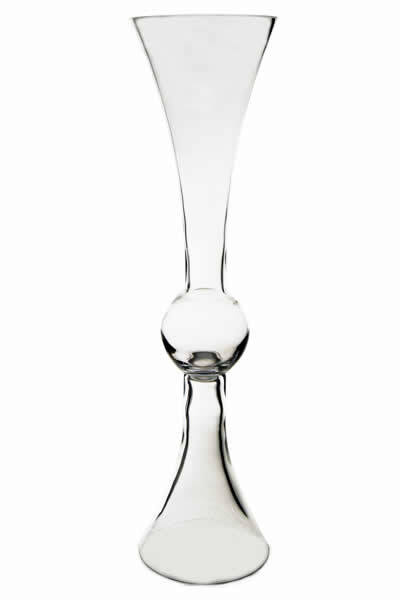 Show off your floral arrangements in this tall glass trumpet vase, also known as pilsner vase. The trumpet vase with its generous flare opening accommodates all kind of flower balls. This tall tapered trumpet vase is perfect for longer stemmed flowers. Try adding branches for a creative centerpiece. Dimension: H-24", Open D - 5.3", Base - 5.3"